It’s no secret that Brian “Dirt” Kinwald mounts a lot of tires and the importance of a clean starting point is very critical. The tire master always starts with a fresh microfiber towel during each track day to ensure a proper connection. Dirt Racing Products, has reached into their bag of tricks to offer a specific towel, now available to the drivers as a packaged set. 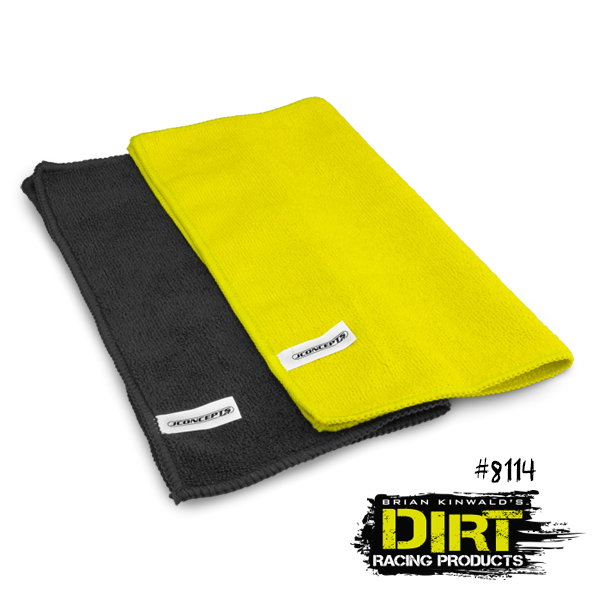 Microfiber towels feature split microfibers, making them the best towel for RC vehicle cleaning applications. Since the towels feature split fibers, each of the hundreds of thousands of fibers have multiple edges which pick up and hold. The Dirt towels enable the racer to pick up and hold more dust, dirt, and liquid than with traditional cotton, disposable cleaning towels, or even other lesser quality microfiber towels. Probably the best use of the microfiber towel is in the tire cleaning process. Before tire mounting can take place, it’s important to clean the beads of the tires and the microfiber is perfect in this application. Place a small amount of a recommended cleaning solution, such as, Dirt Cleaner, on the microfiber towel and thoroughly clean the rubber tire beads. The towels are re-useable, machine washable and can provide many days of use.